Based in a South Minneapolis suburb, the business operates in a 1,252 square foot industrial facility. The owner has meticulously maintained the equipment and recently upgraded many of the presses, polishers and grinders. Monthly rent is $907 and utilities average roughly $200 per month. 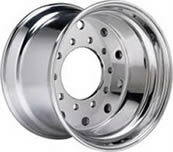 This listing is an established, profitable aluminum wheel service and sales company established since 2006. The company’s primary source of revenue is derived from grinding and polishing used truck wheels dropped off or shipped to the business from an expanding list of 1,500 clients nationwide. A buyer would need a general mechanical aptitude and desire to do a job correctly. The current reputation of the company is the reason business is literally dropped off at the door. A perfect turn-key business with plenty of opportunity for growth. The current owner has already outlined many models to drive growth which could be implemented by an owner operator. This entry was posted on August 25, 2015 by Mac Thelen.